People struggle through a flooded road in Chennai, Tamil Nadu, India. Bobcat filling wetlands outside Ennore creek. Flooded Canal from slight downpour. 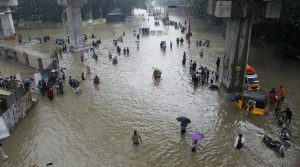 Poor infrastrure and harsh monsoon seasons cause tremendous flood damage in India. The Chennai floods of 2015 costed india’s economy $3 billion in repairs. The cities problem derives from industrial developers encroaching upon the Ennore creek and Kosasthalaiyar rivers. This in turn has caused hundreds to suffer, who live upon these canals. Chennai’s infrastructure also suffers from a lack of storm drains, in which floods arise from the slightest of downpours. Floods in Chennai are man-made rather than natural. The Parliamentary Standing Committee on Home Affairs advised the Tamil Nadu government to, “check mafia involved in illegal construction for business and usurping water bodies for their real estate business.” However, the state government has focused their concerns on terminating the slums around the rivers canals instead of blaming these industries. 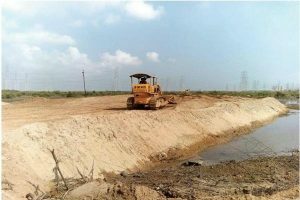 Thirty-five canals that pass through the Kosasthalaiyer are clogged because of a road that leads to the North Chennai Power Plant. The canals allow rain water to drain into the sea. 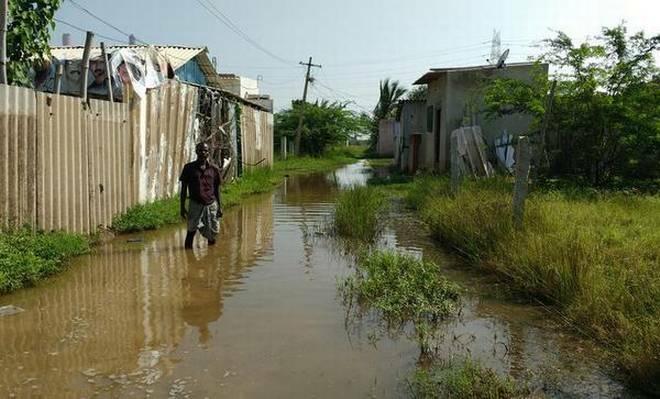 This road has stopped the flow of water and has caused the flooding of many homes in Atthipattu Pudunagar, in Ennore. 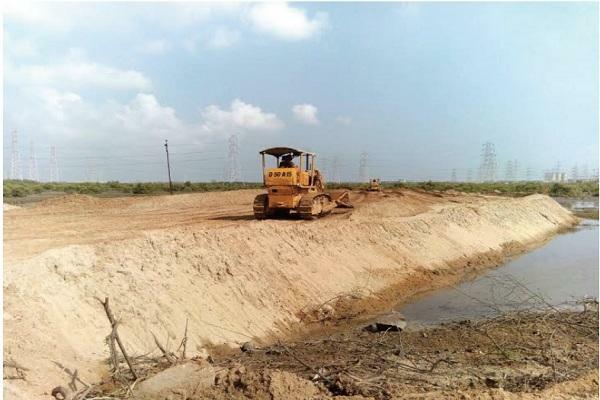 Many strikes have taken place by the people to try and stop the state government from allowing the Kamarajar Port Ltd. (KPL) to build more structures on the Encore Creek. The biggest contributor to the flooding is the encroachment provided by Kamarajar Port Ltd. (KPL). The Encore creek is surrounded by industries who dump their industrial waste into the creek destroying the wild life and ecology, effectively creating a clot in the river. These industrial facilities include the: North Chennai Thermal Power Station (NCTPS), NTECL power plant in Vallur, the Ennore Thermal Power Station (ETPS), Kamarajar Port Ltd. (KPL), and L&T port in Kattupalli. These facilities fill wetlands with earth and sand, which, in turn, destroy the wetlands function in the ecosystem. Wetlands help improve the water quality of an ecosystem and absorb flood waters, as well as, maintaining the surface water during dry periods. When wetlands get filled, rain water has no where to go, instead it sits on the impermeable concrete. Storm drains help with the transportation of water, but Chennai has a severe lack of them, with only 855km storm drains to 2,847 roads. This number could be skewed more, considering that a large proportion get covered with sediments and trash, collected from the run-off of water. Chennai’s rainy season worries many of its residents. Even the lightest down pours create flooding. It must be unimaginable to have witnessed the cyclone of 2015. Madras Christian College (MCC), and Women’s Christian College (WCC), both experienced destruction from the cyclones aftermath. The canopy line at MCC was reduced, and also at WCC, many trees were uprooted. Chennai’s unsustainable development and failure to reject big real estate spenders creates a slippery slope for the city, which in turn, with flooding causes large infrastructural damage and costs.